During our nearly two decades of development work for clients, we have successfully completed many manufacturing web development and design projects. Our clients have asked us to supply the technology and internet marketing skills to help them expand their businesses and improve their processes. A sample of our manufacturing clients include Pactiv, Porter Pipe & Supply, Salter Labs, Tapscott's, Peerless-AV and The Popcorn Factory. If you want to improve your company's operations, consider some highlights of our services for clients in the manufacturing industry. One of the best ways to feature our manufacturing web design and development services is to briefly describe a few examples of our completed projects. Pactiv is a billion-dollar packaging giant. 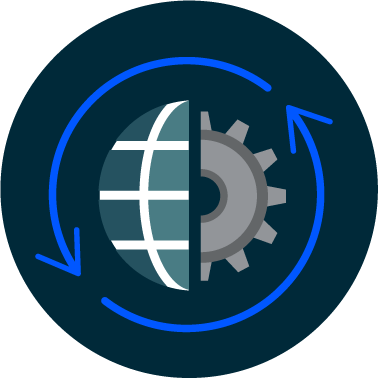 Caxy was brought in to fix the performance of and add features to a global warehouse-management application. The system is able to give a global view of performance for plants around the world. Porter Pipe & Supply is a large manufacturer of pipes for the construction industry. Caxy created a number of tools and apps for them including a mobile app that tells customers where their delivery is and what is on the truck as well as several apps for costing and customer data. Salter Labs makes and distributes innovative medical products. The company needed a way to sell directly to clients without disturbing its existing distributor model. Salter Labs already had an Oracle ERP for pricing contracts. We used existing processes and an upgrade to Oracle to develop an e-commerce website for direct customers. This work included an integration with the Oracle system to fetch prices. The project resulted in higher revenues from the e-commerce site without detracting from existing revenue streams. This 1-800-Flowers company approached us for help to improve its email marketing. Specifically, The Popcorn Factory wanted us to increase conversion rates, engagement and the overall quality of its mailing lists. We segmented the email lists better to make sure that we developed relevant messages to various customers. We used criteria for email list segmentation that included the type of buyer and data about past purchases. We created an array of email templates and schedules to test. This way, we could determine which graphics, times of day or email subject lines performed best. We also worked with marketing staff at The Popcorn Factory to teach them how to manage their email lists in the future. Our work with The Popcorn Factory resulted in higher conversions and more engagement. GE Rail came to us for technical help to resolve problems with missing freight. Losses from stolen or misplaced inventory and supplies are a big problem for manufacturing, retail, health and many other organizations. If companies can't stop or control inventory shrinkage, they end up having to pass higher costs onto their customers or absorb them in their budgets. Luckily, the technology exists to make it possible to pinpoint the location of vehicles, individual items and even people. We worked with GPS technology to keep track of trains. Our system could send location data and visual alerts via an online map. As a result, GE Rail discovered sources of freight leakage that it was able to block. This system helped the company operate with fewer losses right away and would continue to keep freight tracked in the future. Our manufacturing web development and design services depend on an Agile process that guarantees rapid completion and user satisfaction. In fact, we have mastered Agile development so well that other companies call on us for Agile consulting through workshops or interacting with development teams. In addition to creating high-performance applications and marketing campaigns, we focus on developing online apps and websites for our clients. We can also develop or improve all kinds of applications — including mobile, web, progressive or hybrid apps. Clients contact us for help with machine learning, AI, business intelligence, and the IoT for internal or customer-centered applications. Your manufacturing business can rely on Caxy as a complete digital services company. Approach us with your new ideas, problems, or questions about emerging or existing technology. We will step up with the best solutions at every stage, from initial analysis to maintenance. Want to get started with Caxy? Contact us to tell us more about your manufacturing company today.